One of the latest mid sized luxury sedan is revealed introducing the all new BMW 5 series which offers high quality and high class design inside out, this car can carry 5 adults in comfortable seating position. 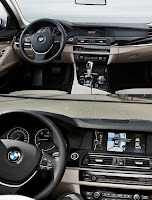 BMW 5 series offers various types of engine, for the gasoline there is one model with an 8 cylinder and 3 others with 6 cylinders, then for the diesel engine BMW offers 2 types of 6 cylinder engine which would be one of the most fuel efficient with a 47 mpg. BMW 5 series offers 528i as the entry level with a 258 horsepower, then next to it is the 530d powered with a diesel engine that produces a 245 hp, then after that is the 535i powered with an turbocharged inline 6 that has a 306 hp, and the top of the line BMW 5 series would be the 550i powered with a V8 turbocharged engine that produces a massive 407 horsepower. The newly add ons for the 2011 BMW 5 series features an 8 speed automatic transmission with an all-wheel drive optional that is marked with an "x". it also has a Park Distance Control and an around view monitor system, similar to Infiniti's Around View Monitor, also an Active Roll Stabilization, BMW 5 series also widens the space between the wheels extending it to almost 10 cm, its overall length has grown 2 cm yet the height has been decreased which stabilizes it even better.